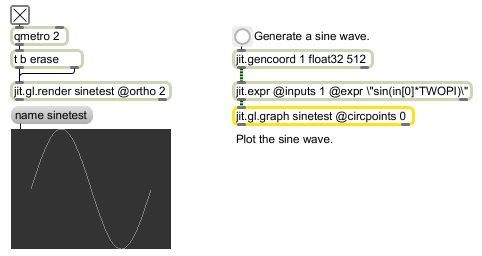 Use jit.gl.graph to render one-dimensional floating point data as a three-dimensional shape. circpoints int The number of circumference points to render for each cylidrical slice. For example, a value of 1 will render a line, a value of 2 will render a planar area, a value of 3 will render the geometry using triangular prisms, etc. radial int Toggles radial mode enable/disable. When enabled, the incoming data is visualized about the circumference of a circle. radialphase float Sets a phase offset when radial mode is enabled.